Operation Enduring Freedom (OEF) was the official name used by the U.S. government for the Global War on Terrorism. On October 7, 2001, in response to the September 11 attacks, President George W. Bush announced that airstrikes targeting Al Qaeda and the Taliban had begun in Afghanistan. Operation Enduring Freedom primarily refers to the War in Afghanistan, but it is also affiliated with counterterrorism operations in other countries, such as OEF-Philippines and OEF-Trans Sahara. During Operation El Dorado in May 2004, U.S. Marines from Alpha Company, Battalion Landing Team, 1st Battalion, 6th Marines, startle the owner of a compound who refused to open his door for a search. After 13 years, on December 28, 2014, President Barack Obama announced the end of Operation Enduring Freedom in Afghanistan. Continued operations in Afghanistan by the United States' military forces, both non-combat and combat, now occur under the name Operation Freedom's Sentinel. Operation Enduring Freedom most commonly refers to the U.S.-led combat mission in Afghanistan, which is a NATO military alliance between the United States, United Kingdom and Afghanistan. OEF is also affiliated with counter-terrorism operations in other countries targeting Al Qaeda and remnants of the Taliban, such as OEF-Philippines and OEF-Trans Sahara, primarily through government funding vehicles. Operation Enduring Freedom – Afghanistan (OEF-A), 7 October 2001 – 31 December 2014. Succeeded by Operation Freedom's Sentinel. The U.S. government used the term "Operation Enduring Freedom – Afghanistan" to officially describe the War in Afghanistan, from the period between 7 October 2001 and 31 December 2014. Continued operations in Afghanistan by the United States' military forces, both non-combat and combat, now occur under the name Operation Freedom's Sentinel. The operation was originally called "Operation Infinite Justice", but as similar phrases have been used by adherents of several religions as an exclusive description of God, it is believed to have been changed to avoid offense to Muslims who are the majority religion in Afghanistan. In September 2001, U.S. President George W. Bush's remark that "this crusade, this war on terrorism, is going to take a while", which prompted widespread criticism from the Islamic world, may also have contributed to the renaming of the operation. The term "OEF-A" typically refers to the phase of the War in Afghanistan from 2001 to 2014. Other operations, such as the Georgia Train and Equip Program, are only loosely or nominally connected, such as through government funding vehicles. All the operations, however, have a focus on counterterrorism activities. Operation Enduring Freedom – Afghanistan, which was a joint U.S., U.K., and Afghan operation, was separate from the International Security Assistance Force (ISAF), which was an operation of North Atlantic Treaty Organization nations including the U.S. and the U.K. The two operations ran in parallel, although it had been suggested that they merge. The initial military objectives of OEF-A, as articulated by President George W. Bush in his 20 September Address to a Joint Session of Congress and his 7 October address to the country, included the destruction of terrorist training camps and infrastructure within Afghanistan, the capture of al-Qaeda leaders, and the cessation of terrorist activities in Afghanistan. In October 2002, the Combined Task Force 150 and United States military Special Forces established themselves in Djibouti at Camp Lemonnier. The stated goals of the operation were to provide humanitarian aid and patrol the Horn of Africa to reduce the abilities of terrorist organizations in the region. Similar to OEF-P, the goal of humanitarian aid was emphasized, ostensibly to prevent militant organizations from being able to take hold amongst the population as well as reemerge after being removed. Seizing upon a power vacuum after the Soviets withdrew from Afghanistan after their invasion, the Taliban had the role of government from 1996–2001. Their extreme interpretation of Islamic law prompted them to ban music, television, sports, and dancing, and enforce harsh judicial penalties (See Human rights in Afghanistan). Amputation was an accepted form of punishment for stealing, and public executions could often be seen at the Kabul football stadium. Women's rights groups around the world were frequently critical as the Taliban banned women from appearing in public or holding many jobs outside the home. They drew further criticism[by whom?] when they destroyed the Buddhas of Bamyan, historical statues nearly 1,500 years old, because the Buddhas were considered idols. On 4 October 2001, it was reported that the Taliban covertly offered to turn bin Laden over to Pakistan for trial in an international tribunal that operated according to Islamic shar'ia law. On 7 October 2001, the Taliban proposed to try bin Laden in Afghanistan in an Islamic court. This proposition was immediately rejected by the US. Later on the same day, United States and British forces initiated military action against the Taliban, bombing Taliban forces and al-Qaeda terrorist training camps. On 14 October 2001, the Taliban proposed to hand bin Laden over to a third country for trial, but only if they were given evidence of bin Laden's involvement in the events of 11 September 2001. The US rejected this proposal and military operations ensued. 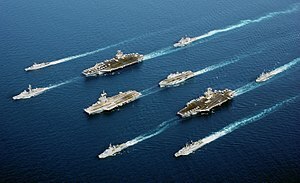 5-country multinational fleet, during "Operation Enduring Freedom" in the Oman Sea. In four descending columns, from left to right: Maestrale, De Grasse; USS John C. Stennis, Charles de Gaulle, Surcouf; USS Port Royal, HMS Ocean, USS John F. Kennedy, HNLMS Van Amstel; and Durand de la Penne. The Northern Alliance, aided by Joint Special Operations teams consisting of Green Berets from the 5th Special Forces Group, aircrew members from the 160th Special Operations Aviation Regiment (SOAR), and Air Force Combat Controllers, fought against the Taliban. Aided by U.S. bombing and massive defections, they captured Mazar-i-Sharif on 9 November. They then rapidly gained control of most of northern Afghanistan, and took control of Kabul on 13 November after the Taliban unexpectedly fled the city. The Taliban were restricted to a smaller and smaller region, with Kunduz, the last Taliban-held city in the north, captured on 26 November. Most of the Taliban fled to Pakistan. The war continued in the south of the country, where the Taliban retreated to Kandahar. After Kandahar fell in December, remnants of the Taliban and al-Qaeda continued to mount resistance. Meanwhile, in November 2001 the U.S. military and its allied forces established their first ground base in Afghanistan to the south west of Kandahar, known as FOB Rhino. The Battle of Tora Bora, involving U.S., British and Northern Alliance forces took place in December 2001 to further destroy the Taliban and suspected al-Qaeda in Afghanistan. In early March 2002 the United States military, along with allied Afghan military forces, conducted a large operation to destroy al-Qaeda in an operation code-named Operation Anaconda. The operation was carried out by elements of the United States 10th Mountain Division, 101st Airborne Division, the U.S. special forces groups TF 11, TF Bowie, TF Dagger, TF K-Bar, British Royal Marines, the Norwegian Forsvarets Spesialkommando (FSK), Hærens Jegerkommando and Marinejegerkommandoen, Canada's 3rd Battalion Princess Patricia's Canadian Light Infantry, Canada's Joint Task Force 2, the German KSK, and elements of the Australian Special Air Service Regiment and of the New Zealand Special Air Service and the Afghan National Army. The U.S.-led coalition initially removed the Taliban from power and seriously crippled al-Qaeda and associated militants in Afghanistan. However, success in quelling the Taliban insurgency since the 2001 invasion has been mixed. Many believe[who?] the Taliban cannot be defeated as long as it has sanctuary in neighboring Pakistan and that Operation Enduring Freedom has transformed into a continuing full-fledged war with no end in sight. While military forces interdict insurgents and assure security, Provincial reconstruction teams are tasked with infrastructure building, such as constructing roads and bridges, assisting during floods, and providing food and water to refugees. Many warlords have participated in an allegiance program, recognizing the legitimacy of the government of Afghanistan, and surrendering their soldiers and weapons; however, subsequent actions have led to questions about their true loyalties. The Afghan National Army, Afghan National Police, and Afghan Border Police are being trained to assume the task of securing their nation. On 31 December 2014, Operation Enduring Freedom - Afghanistan concluded, and was succeeded by Operation Freedom's Sentinel on 1 January 2015. Hardliner newspapers in Iran and religious scholars in Lebanon suggested "Infinite Imperialism," "Infinite Arrogance," or "Infinite Injustice" might have been more appropriate name for the operation. AFP, reporting on a news story in the Sunday, 3 April 2004, issue of The New Yorker, wrote that retired Army Colonel Hy Rothstein, "who served in the Army Special Forces for more than 20 years, ...commissioned by The Pentagon to examine the war in Afghanistan concluded the conflict created conditions that have given 'warlordism, banditry and opium production a new lease on life'..."
The conduct of U.S. forces was criticised in a report entitled Enduring Freedom – Abuses by U.S. Forces in Afghanistan by U.S.-based human rights group Human Rights Watch in 2004. Some Pakistani scholars, such as Masood Ashraf Raja, editor of Pakistaniaat, have also provided a more specific form of criticism that relates to the consequences of the Global War on Terrorism on the region. The Abu Sayyaf Group (ASG) Al Harakat Al Islamiyya, is deemed a "foreign terrorist organization" by the United States government. Specifically, it is an Islamist separatist group based in and around the southern islands of the Republic of the Philippines, primarily Jolo, Basilan, and Mindanao. Since inception in the early 1990s, the group has carried out bombings, assassinations, kidnappings, and extortion in their fight for an independent Islamic state in western Mindanao and the Sulu Archipelago. Its claimed overarching goal is to create a Pan-Islamic superstate across the Malay portions of Southeast Asia, spanning, from east to west, the large island of Mindanao, the Sulu Archipelago (Basilan and Jolo islands), the large island of Borneo (Malaysia and Indonesia), the South China Sea, and the Malay Peninsula (Peninsular Malaysia, Thailand and Myanmar). Jemaah Islamiyah is a militant Islamic terrorist organization dedicated to the establishment of a fundamentalist Islamic theocracy in Southeast Asia, in particular Indonesia, Singapore, Brunei, Malaysia, the south of Thailand and the Philippines. Jemaah Islamiyah originally used peaceful means to achieve its goals, but later resorted to terrorism because of its connections with al-Qaeda. Financial links between Jemaah Islamiyah and other terrorist groups, such as Abu Sayyaf and al-Qaeda, have been found to exist. Jemaah Islamiyah means "Islamic Group" or "Islamic Community" and is often abbreviated JI. Jemaah Islamiyah is thought to have killed hundreds of civilians. Also, it is suspected of carrying out the Bali car bombing on 12 October 2002, in which suicide bombers attacked a nightclub killing 202 people and wounding many more. Most of the casualties were Australian tourists. After this attack, the U.S. State Department designated Jemaah Islamiyah as a Foreign Terrorist Organization. Jemaah Islamiyah is also suspected of carrying out the Zamboanga bombings, the Metro Manila bombings, the 2004 Australian embassy bombing and the 2005 Bali terrorist bombing. The United States Special Forces (SF) unit trained and equipped special forces and scout rangers of the AFP, creating the Light Reaction Company (LRC). The LRC and elements of SOCPAC deployed to Basilan on completion of their training. The stated goals of the deployment were denying the ASG sanctuary, surveiling, controlling, and denying ASG routes, surveiling supporting villages and key personnel, conducting local training to overcome AFP weaknesses and sustain AFP strengths, supporting operations by the AFP "strike force" (LRC) in the area of responsibility (AOR), conducting and supporting civil affairs operations in the AOR. The desired result was for the AFP to gain sufficient capability to locate and destroy the ASG, to recover hostages and to enhance the legitimacy of the Philippine government. Much of the operation was a success: the ASG was driven from Basilan and one U.S. hostage was recovered. The Abu Sayyaf Group's ranks, which once counted more than 800 members, was reduced to less than 100. The humanitarian portion of the operation, Operation Smiles, created 14 schools, 7 clinics, 3 hospitals and provided medical care to over 18,000 residents of Basilan. Humanitarian groups were able to continue their work without fear of further kidnappings and terrorists attacks by the Abu Sayyaf Group. Unlike other operations contained in Operation Enduring Freedom, OEF-HOA does not have a specific terrorist organization as a target. OEF-HOA instead focuses its efforts to disrupt and detect terrorist activities in the region and to work with host nations to deny the reemergence of terrorist cells and activities. Operations began in mid-2002 at Camp Lemonnier by a Combined Joint Special Operations Task Force (CJSOTF) augmented by support forces from Fort Stewart, Fort Hood, and Fort Story. In October 2002, the Combined Joint Task Force, Horn of Africa (CJTF-HOA) was established at Djibouti at Camp Lemonnier, taking over responsibilities from the CJSOTF. CJTF-HOA comprised approximately 2,000 personnel including U.S. military and Special Operations Forces (SOF), and coalition force members, Combined Task Force 150 (CTF-150). The coalition force consists of ships from Australia, Canada, France, Germany, Netherlands, India, Italy, Pakistan, New Zealand, Spain, Turkey and the United Kingdom. The primary goal of the coalition forces is to monitor, inspect, board and stop suspected shipments from entering the Horn of Africa region. Since 2003, the U.S. Military also conducts operations targeting Al-Qaeda-linked fighters in Somalia, these operations had reportedly killed between 113 and 136 militants by early 2016. On 7 March 2016, a further 150 were killed in U.S. airstrikes on an al Shabaab training camp north of Mogadishu. CJTF-HOA has devoted the majority of its efforts to train selected armed forces units of the countries of Djibouti, Kenya and Ethiopia in counterterrorism and counterinsurgency tactics. Humanitarian efforts conducted by CJTF-HOA include the rebuilding of schools and medical clinics, as well as providing medical services to those countries whose forces are being trained. The program expands as part of the Trans-Saharan Counter Terrorism Initiative as CJTF personnel also assist in training the forces of Chad, Niger, Mauritania and Mali. Anti-piracy operations were undertaken by the coalition throughout 2006 with a battle fought in March when US vessels were attacked by pirates. In January 2007, during the war in Somalia, an AC-130 airstrike was conducted against al-Qaeda members embedded with forces of the Islamic Courts Union (ICU) operating in southern Somalia near Ras Kamboni. US naval forces, including the aircraft carrier USS Dwight D. Eisenhower, were positioned off the coast of Somalia to provide support and to prevent any al-Qaeda forces escaping by sea. Actions against pirates also occurred in June and October 2007 with varying amounts of success. Effective 1 January 2015, Secretary of Defense Hagel announced that the new U.S. mission in Afghanistan will focus on training, advising, and assisting Afghan security forces and designated as Operation Freedom's Sentinel. 19 About 13,500 U.S. troops are expected in Afghanistan through 2015 and will be assisted by troops from NATO allies. ^ Philippines, AU: Embassy . ^ Torreon, Barbara Salazar (2017). U.S. Periods of War and Dates of Recent Conflicts (PDF). Washington, D.C.: Congressional Research Service. p. 7. ^ "Operation Enduring Freedom". Naval History and Heritage Command, United States Navy. Retrieved 3 May 2018. ^ a b c d e f g h i j k "Operation Enduring Freedom, Afghanistan". ICasualties.org. Archived from the original on 26 January 2016. Retrieved 29 January 2016. ^ "The Bureau of Investigative Journalism", Somalia Datasheet. Retrieved 4 February 2016. ^ Cooper, Helene. ""US Strikes Kill 150 Shabab fighters in Somalia, officials say". Washington Post. 7 March 2016. "American warplanes on Saturday struck a training camp in Somalia belonging to the Islamist militant group the Shabab, the Pentagon said, killing about 150 fighters who United States officials said were preparing an attack against American troops and their regional allies in East Africa." ^ "Operation Enduring Freedom Fast Facts". CNN. Retrieved 17 August 2017. ^ a b Philipps, Dave (31 December 2014). "Mission Ends in Afghanistan, but Sacrifices Are Not Over for U.S. Soldiers". The New York Times. Retrieved 17 August 2017. ^ a b Dempsey, Judy (20 July 2005). "NATO to add to Afghanistan troops". The New York Times. Retrieved 17 August 2017. ^ a b c "Helping Georgia?". Boston University Institute for the Study of Conflict, Ideology and Policy. March – April 2002. Retrieved 14 February 2007. ^ a b Lamothe, Dan (29 December 2014). "Meet Operation Freedom's Sentinel, the Pentagon's new mission in Afghanistan". The Washington Post. Retrieved 17 August 2017. ^ DOD News, Defense Media Activity (29 December 2014). "Operation Enduring Freedom comes to an end". U.S. Army. Retrieved 17 August 2017. ^ Tilghman, Andrew (19 February 2015). "Despite war's end, Pentagon extends Afghanistan campaign medal". MilitaryTimes. Gannett. Retrieved 28 February 2015. Sisk, Richard (29 December 2014). "Amid Confusion, DoD Names New Mission 'Operation Freedom's Sentinel'". Military.com. Retrieved 28 February 2015. Tomei, Lizzy (6 January 2015). "It's 2015. Time For Some New US Operations In Iraq And Afghanistan". Mint Press News. Retrieved 28 February 2015. Rosenberg, Matthew; Scmitt, Eric; Mazzetti, Mark (12 February 2015). "U.S. Is Escalating a Secretive War in Afghanistan". New York Times. Retrieved 28 February 2015. ^ a b United States Department of Defense (December 2014). "Obama, Hagel Mark End of Operation Enduring Freedom". Defense. United States of America: United States Department of Defense. Retrieved 21 March 2015. ^ Turse, Nick (20 January 2015). "US Special Operations Forces Are in More Countries Than You Can Imagine". The Nation. Retrieved 17 August 2017. ^ Spencer C. Tucker (8 October 2010). The Encyclopedia of Middle East Wars: The United States in the Persian Gulf, Afghanistan, and Iraq Conflicts [5 volumes]: The United States in the Persian Gulf, Afghanistan, and Iraq Conflicts. ABC-CLIO. p. 415. ISBN 978-1-85109-948-1. Raymond Monsour Scurfield; Katherine Theresa Platoni (10 September 2012). War Trauma and Its Wake: Expanding the Circle of Healing. Routledge. p. 268. ISBN 978-1-136-45788-3. ^ Bolger, Daniel P. (2014). Why We Lost: A General's Inside Account of the Iraq and Afghanistan Wars. Houghton Mifflin Harcourt. p. xiii, 415. ISBN 9780544370487. ^ "Operation Enduring Freedom comes to an end". United States Army. 29 December 2014. Retrieved 28 February 2015. ^ a b c "Infinite Justice, out – Enduring Freedom". BBC News. 25 September 2001. ^ Great Britain: Parliament: House of Commons: Defence Committee (2006). The UK Deployment to Afghanistan: Fifth Report of Session 2005-06; Report, Together with Formal Minutes, Oral and Written Evidence. The Stationery Office. p. 39. ISBN 978-0-215-02828-0. ^ David T. Zabecki Ph.D. (28 October 2014). Germany at War: 400 Years of Military History [4 volumes]. ABC-CLIO. p. 6. ISBN 978-1-59884-981-3. ^ "Bush Announces Start of a "War on Terror"". Global security. 20 September 2001. ^ "President Bush Announces Military Strikes in Afghanistan". Global security. 7 October 2001. ^ "Operation Enduring Freedom – Afghanistan". Global security. ^ Fargo, ADM Tom (10 February 2003). "PASOC 2003 Conference – Waikiki Beach Marriott Resort". Speeches and Transcripts. U.S. Pacific Command. Archived from the original on 13 May 2008. ^ a b "Operation Smiles" (PDF). U.S. Pacific Command. Archived from the original (PDF) on 26 March 2009. ^ "Taliban publicly execute murderer, amputate two robbers". Rawa. 14 August 1998. Retrieved 27 March 2011. ^ "The Afghan Taliban: Like It or Not, It Occupies Two-Thirds of Afghanistan and Shows No Sign of Weakening". Washington report. Archived from the original on 8 January 2010. Retrieved 27 March 2011. ^ "Filmed by RAWA: Taliban publicly execute an Afghan woman". Rawa. Retrieved 27 March 2011. ^ Luke Hunt. "Former Warlord Primed For Afghan Presidency". The Diplomat. Retrieved 21 May 2018. ^ "5" (PDF), Report (PDF)|format= requires |url= (help), US: 9/11 commission . ^ "Transcript of President Bush's address – CNN". CNN. 21 September 2001. Retrieved 27 March 2011. ^ "Taliban Won't Turn Over Bin Laden". CBS News. 21 September 2001. Retrieved 27 March 2011. ^ "Briefing 05: The Smoking Gun". J-n-v.org. 8 October 2001. Retrieved 27 March 2011. ^ "U.S. rejects Taliban offer to try bin Laden". CNN. 7 October 2001. Archived from the original on 15 April 2011. Retrieved 6 March 2016. ^ "Bush to Taliban: 'Time is running out'". CNN. 7 October 2001. Archived from the original on 16 September 2010. Retrieved 27 March 2011. ^ "Bush rejects Taliban offer to hand Bin Laden over". Guardian. UK. 14 October 2001. Retrieved 27 March 2011. ^ "CNN.com - Bush announces opening of attacks - October 7, 2001". www.cnn.com. Retrieved 21 May 2018. ^ Kellner, Douglas (2003). From 9/11 to terror war : the dangers of the Bush legacy. Lanham: Rowman & Littlefield. p. 145. ISBN 0585463255. OCLC 52802017. ^ "MEU(SOC)s in OEF-A - Special Operations Forces and Operation Enduring Freedom | Defense Media Network". Defense Media Network. Retrieved 21 May 2018. ^ United States Department of Defense (19 February 2015). "Operation Freedom's Sentinel Qualifies for Campaign Medal". Defense. United States of America: United States Department of Defense. Retrieved 19 March 2015. ^ "Analysis: Straw's visit divides Iran". 24 September 2001. Retrieved 19 February 2019. ^ 1944-, Williams, Paul L., (2004). Osama's revenge : the next 9-11 : what the media and the government haven't told you. Amherst, NY: Prometheus Books. p. 68. ISBN 1591022525. OCLC 54823028. ^ Dower, John W. (2010). Cultures of War: Pearl Harbor / Hiroshima / 9-11 / Iraq. W. W. Norton & Company. p. 466. ISBN 9780393080476. ^ Moaveni, Azadeh (27 September – 3 October 2001). "As the British Foreign Secretary courts Iran to aid a US-led coalition against terrorism, Tehran struggles for consensus and considers the incentives for cooperation". Al-Ahram Weekly. Retrieved 18 February 2019. ^ South Asia, Channel news Asia, archived from the original on 5 April 2004 . ^ "The Rhetoric of Democracy and War on Terror: The Case of Pakistan". Pakistaniaat: A Journal of Pakistan Studies. 1 (2): 60–65. 2009. ^ a b "Abu Sayyaf Group (Philippines, Islamist separatists)". Council on Foreign Relations. Retrieved 21 May 2018. ^ "Profile: Jemaah Islamiah". BBC News. 2 February 2012. Retrieved 21 May 2018. ^ "Funding Terrorism in Southeast Asia: The Financial Network of Al Qaeda and Jemaah Islamiyah" (PDF). Nbr.org. Retrieved 27 March 2011. ^ a b Maxwell, Colonel David S. "The U.S. Army Professional Writing Collection". Army. Archived from the original on 12 April 2010. Retrieved 27 March 2011. ^ "US strike kills at least 150 al Shebab fighters in Somalia". Yahoo news. 8 March 2016. ^ "iCasualties: Operation Iraqi Freedom and Operation Enduring Freedom Casualties". icasualties.org. Retrieved 29 October 2018. Maloney, Sean M (2005), Enduring the Freedom: A Rogue Historian in Afghanistan, Washington, DC: Potomac Books, ISBN 1-57488-953-2 . Wikimedia Commons has media related to Operation Enduring Freedom. Moorthy, Neelesh (July 6, 2016). "Obama increases U.S. troops to remain in Afghanistan past 2016". Politifact.